What does General Prayuth expect from Russia? 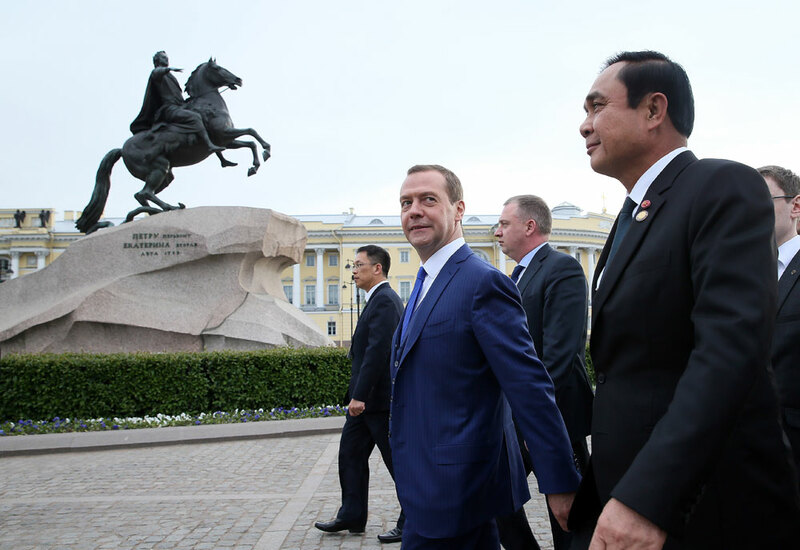 Foreground, from left: Russian Prime Minister Dmitry Medvedev and Prime Minister of Thailand Prayut Chan-o-cha near the Bronze Horseman, an equestrian statue of Peter the Great, on Senate Square in St. Petersburg. In St. Petersburg, Thai Prime Minister Prayuth Chan-o-cha and seven of his ministers gave a detailed account to the Russian business community about what Thailand wants from Russia. He then held talks with Dmitry Medvedev, after which the two countries signed 14 agreements. If at the end of the 19th century, the King of Siam, Rama V, was looking to St. Petersburg for political support to defend the independence of his country from England and France, Thailand's Prime Minister, Gen Prayuth Chan-o-cha, who took seven trade and business-related ministers with him to the city this week, only had the Kingdom’s economy in mind. “The countries that have technologies can cope better with financial crises,” he said at the Russian-Thai Business Forum at the Four Seasons Hotel near St. Isaac's Cathedral on the day before the ASEAN-Russia summit in Sochi. If we break down the prime minister’s 90-minute speech, it becomes clear that Thailand is looking for three things from Russia: a market for Thai goods (80 percent of Thailand's revenues come from exports), technologies and investments. Whether deliberately or not, Chan-o-cha never used the words “oil” or “gas,” when speaking in a country, which is accused of being excessively dependent on energy exports. Instead, he spoke about technologies. He mentioned the need for a balance between industrial development and the preservation of nature, and how this could be achieved by using green technologies. Chan-o-cha also called for the creation of institutions with Russia to study innovation. He emphasized the fact that better technology would give added value to Thailand’s traditional export goods and reduce the impact of climate change. “We want Russia to help our country in the development of innovative technologies, so that our products become more competitive… Technology is also a kind of investment,” Chan-o-cha said, while giving a detailed list of industries, where there is a need for technologies such as agriculture, aircraft and mechanical engineering, and robotics. He also called on Russia to invest in Thailand. “We have a growing GDP (+3.2 percent in 2015) and very low annual inflation (+0.5 percent), so be confident in the Thai economy," Chan-o-cha said. Sitting at the Montferrand Ballroom, Russian businessmen were not prepared for the fact that the Thai Prime Minister would say so much and in such detail. He essentially called on them to help upgrade the Thai economy. The Russian business community, however, accepted the challenge. According to Alexei Repik, president of the Russian public organization Delovaya Rossiya (Business Russia), Russian companies are ready to offer everything that Chan-o-cha needs. “Thailand will not buy uncompetitive technologies from Russia and will not work in those niches where it can find a more efficient partner,” Repik said. He added that the main barrier between Russia and Thailand is that there are areas where the parties have never cooperated. Repik said the countries needed to set ambitious goals. As an example, he cited the private Russian-Thai Business House – established at the beginning of 2016 – through which $30 million worth of contracts has been signed between companies from the non-primary sectors of the economy. Memorandum of Understanding between the Morton Group (Russia) and the Pido Group (Thailand).